What hotel amenity do kids care most about? Thirty-seven percent of American kids and 75 percent of parents named the pool, according to a wide family vacation survey by HomeAway. Good luck pulling your kids away from these standout splashgrounds. At Atlantis Resort on Paradise Island in the Bahamas, families can enjoy complimentary access to the resort's jaw-dropping 141-acre Aquaventure waterscape, featuring incredible Atlantean-themed towers, thrilling high-speed water slides, a mile-long river ride with rolling rapids and wave surges, 20 swimming areas, a spectacular kids water-play fort, and 11 unique swimming pools. The waterplay areas at Aulani, Disney's lush Hawaiian outpost, are drop-dead gorgeous, with multiple pools for adults and kids (including one with zero-depth entry), a lazy river, two water slides, a splash pad, an interactive wet-play structure, and a private 3,800-square-foot private saltwater lagoon where families can snorkel among tropical fish to their hearts' content. There are dance parties and Disney character appearances here, but the vibe is much more low-key than in the theme parks, and families are treated to an authentic Hawaiian experience. Keeping cool in the Texas heat is no problem whatsoever at the Hyatt Regency Hill Country Resort & Spa, thanks to the five-acre water park that includes a 950-foot lazy river inspired by the historic Guadalupe River just north of San Antonio. There's also a 22-foot water slide, a Flowrider surfing simulator, a sandy beach, and four pools, including a zero-depth entry pool for little swimmers. 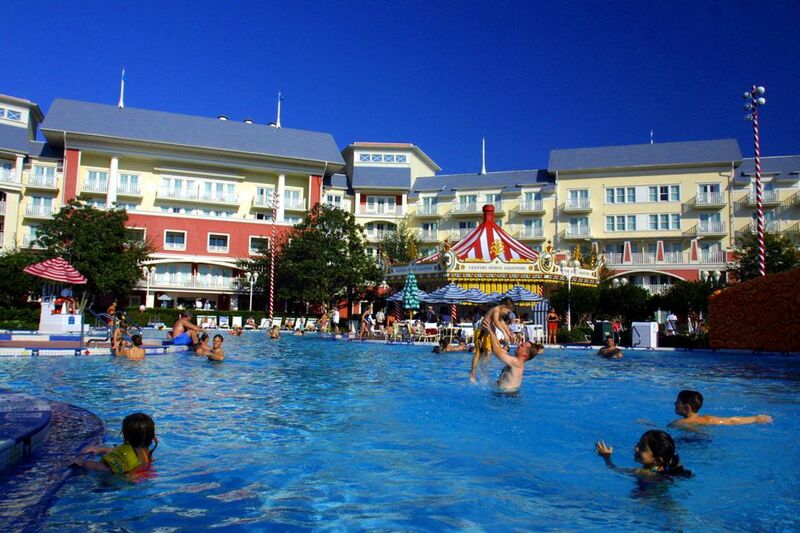 It's incredibly difficult to single out a favorite pool among the many outstanding swimming holes at Disney World Resorts, but Stormalong Bay is at the top of our list. Disney's neighboring Yacht Club and Beach Club resorts share the 795,000-gallon, three-acre aquatic playground known for its lazy river and 230-foot-long water slide that zooms out of a replica pirate ship. Kids can wade into the zero-depth entry of the sand-bottomed pool as if it were a gently sloping beach, and kid-size loaner life vests are readily available. Phoenix is no slouch when it comes to upscale hotels with fabulous water parks, but it's hard to top the sprawling Arizona Grand's seven-acre Oasis Park, which features three thrilling water slides, a 10,000-square-foot wave pool, and a lazy Zuni River. Oh, and those are in addition to the resort's six swimming locales spread across the resort grounds. The pool area at Hyatt Regency Coconut Point Resort & Spa just got a lot better, adding one acre to the hotel's existing two-acre poolscape to make it one of the largest in southwest Florida. The addition brought a trio of three-story water slides (two speed slides and one inner-tube slide) totaling 900 feet of winding, thrilling fun. There's also a new 1,095-foot heated lazy river, which joins the resort’s existing 2,700-square-foot Waterfall Pool with cool water cascades, 5,000-square-foot heated Adventure Pool with a 140-foot corkscrew slide, a free-form lagoon-style pool, and an adults-only heated pool with an adjacent hot tub. One of the coolest pools on our list is also the hottest. The pride of Glendwood Hot Springs Lodge is the world's largest hot springs pool. Covering two city blocks, the pool is fed by natural mineral springs that keep the water at a toasty 104 degrees Fahrenheit. The elaborate pool features a kiddie section, diving pool, and several water slides, and families are welcome to use inflatable rafts, noodles, and even snorkel gear. Guests staying on the sprawling Grande Lakes campus in Orlando get two resorts for the price of one. Whether you stay at the Ritz-Carlton or the JW Marriott Orlando Grande Lakes, you have access to both the Ritz's lovely pool and the Marriott's spectacular 24,000-square-foot, zero-entry lazy river pool that cuts through rock formations and under small waterfalls. Should your family ever tire of Maui's stunning Wailea Beach, the enormous pool complex at the Grand Wailea offers nine (count 'em, nine) pools, including one with a Tarzan-inspired rope swing that's a kid magnet. A not-always-so-lazy 2,000-foot river runs through the whole place, varying its tempo between calm dawdle and brisk whitewater. 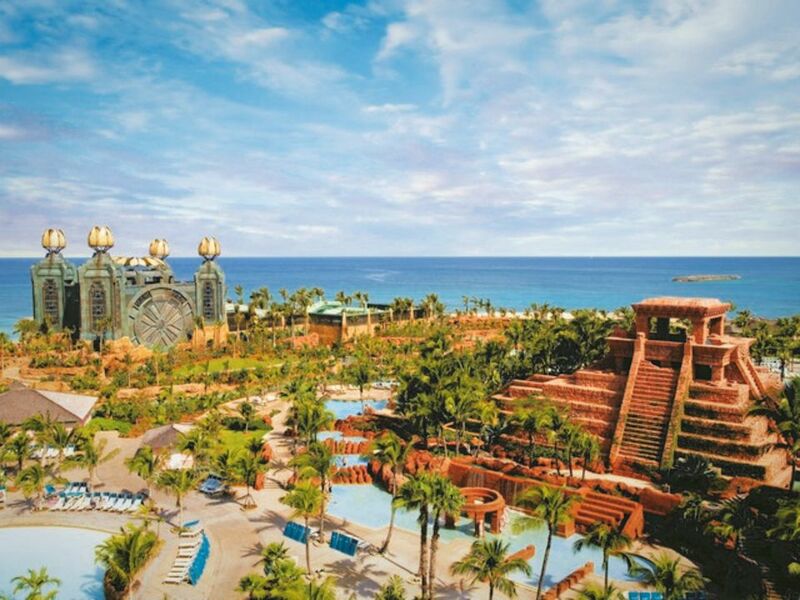 You can also try out the five water slides, three hot tubs, and the world's one-and-only water elevator that rises and falls in a faux volcano (imagine a giant wet Sit 'n Spin and you've got the idea) as well as six waterfalls and truly beautiful tropical landscaping. On Florida's Duck Key, each of the six pools at Hawks Cay Resort offers spectacular views amid a lush tropical setting. Younger kids gravitate to the Pirate Ship Pool with its slides, water cannons, raining palm trees, and shallow areas that are perfect for fledgling swimmers. Yet the resort's showstopper is surely its enclosed saltwater lagoon, where families can snorkel among small tropical fish, stroll on the sandy beach, paddle around in tiki boats, and keep a look out for sea turtles swimming in the clear waters of the harbor. Just north of San Diego in Carlsbad, a stone's throw from Legoland California, the Spanish-style Omni La Costa has a posh golf-and-spa reputation and a seriously amazing pool area and waterplay area. Of the eight swimming pools, the best for younger kids are the zero-entry Sandy Beach Family Pool and the Splash Landing Pools, with their dual 100-foot curvy waterslides and shorter, tot-friendly slide. The most luxurious of Universal Orlando's on-site hotels, the Loews Portofino Bay Hotel offers families a slice of Italy that is truly magnifico. Of the hotel's trio of pools, the Beach Pool is the most family friendly, with a Roman aqueduct-themed water slide that will delight big kids while little ones frolic on a sandy beach and splash in the adjacent children’s pool. The historic grande dame of Colorado hotels is The Broadmoor, whose heated, zero-entry infinity pool appears to flow seamlessly into Cheyenne Lake as the mountains provide a stunning backdrop. Kids will love the dual water slides that plunge into a separate landing pool. There's also a lap pool, children's wading pool, two oversized whirlpools, and an indoor spa pool. There are hotel pools and there are hotel water parks. At the JW Marriott San Antonio Hill Country Resort & Spa, the River Bluff Water Experience definitely qualifies as the latter, with a 650-foot rapid-river ride and a 1,100-foot lazy river (for both those who want a thrill and who want a snooze), 275-foot water tower tube slides, zero-entry children’s pool splash pool, an adult pool, whirlpools, and lots of interactive water features. The retro Disneyland Hotel at Disneyland Resort has three pools, including the 4,800-square-foot E-Ticket Pool that pays tribute to the park's earliest days and the serene D-Ticket Pool that offers a quieter place to cool off in style. But it's the Monorail Pool that's the family favorite, with its two winding water slides that feature replicas of the park's original Mark 1 Monorail trains. The Omni Homestead Resort may be an 18th-century National Historic Landmark, but its two-acre Allegheny Springs water park is bang-up-to-date, with a spring-fed family pool, interactive waterplay zone, sandy beach, two 100-foot water slides, and a 400-foot lazy river. Those are in addition to the resort's magnificent circa-1904, spring-fed indoor pool and serene outdoor spa pool. Beautifully set with a view along the James River, Kingsmill Resort's River Pool complex is a water wonderland, complete with zero-entry pool and sandy beach, waterslide, lazy river, firepit, and poolside restaurant. The pool is located at the resort's sports club, where you'll also find an indoor pool as well as fishing, kayaking, Jet Skiing, and paddleboarding. The sprawling Orlando World Center Marriott's trio of slides are among the tallest and fastest resort water slides in the Sunshine State. There are also six pools (including one indoor and one zero entry), four hot tubs, soothing waterfalls, and plenty of activities to keep the kids happily occupied, from resort games and sand castle building to tennis, basketball, and volleyball.